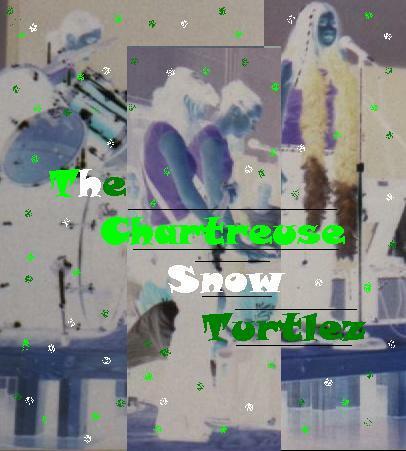 Your lovely webmistress is in a band, and Id like to introduce The Chartreuse Snow Turtlez to you! Sandy wrote me a note one day over a year ago suggesting that we start a band. She had picked up guitar over the last few months, and knew I could play keyboard. We asked our friend Cori if she wanted to play drums for us because her brother had a set, and she could kind of play drums. Unfortunately, she said no. 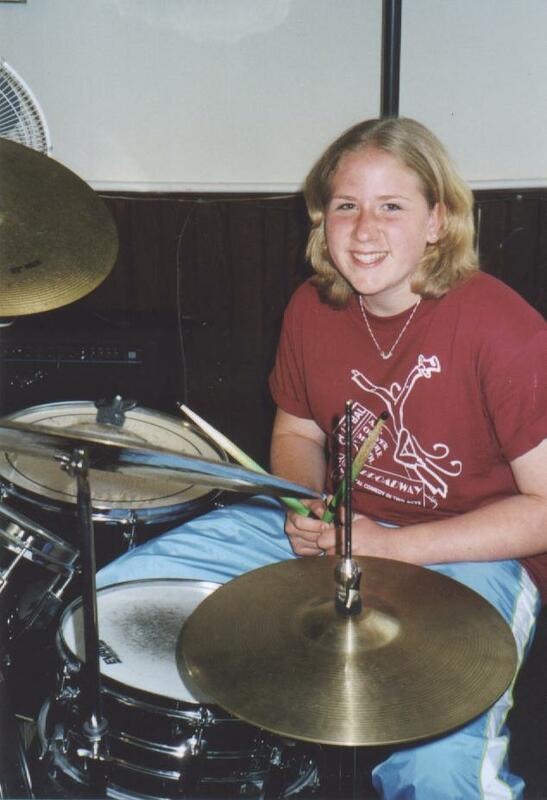 Then we asked Shannon because it had always seemed that she wanted to learn drums. Without even having a single rehearsal, we came up with our name. Sandy and I decided that whatever we dreamed about would be the name of our band. First she had a dream about getting free ice from Wegman's [local grocery store] with Paul McCartney. Then I had a dream about ice skating in my living room. Then I had a dream about being in a snow-filled auditorium while watching the Beatles perform "Help". We knew that snow or ice had to be used in our name. 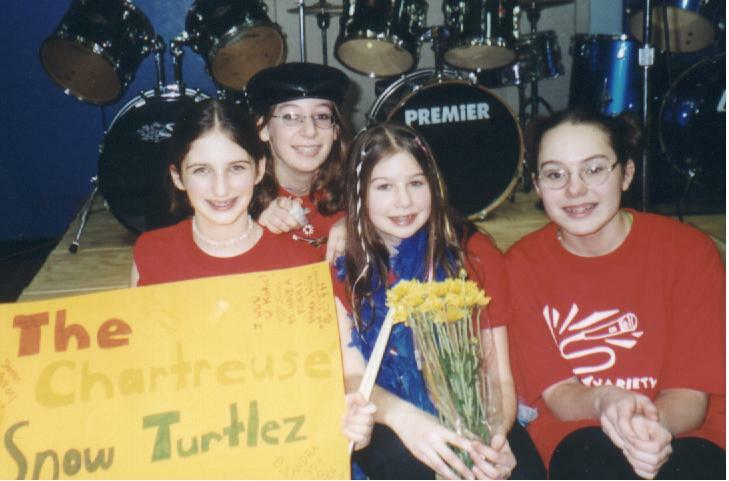 Sandy's sister said we should have an animal name misspelled (like the BeAtles), so we chose TurtleZ. Then we picked a colour for these Snow Turtlez to be. Chartreuse [neon yellow-green] was perfect. Then things got crazy. While Shannon seemed kind of out of the band already, Emi expressed an interest in joining. She was our new drummer. One problem, she had no drums either. 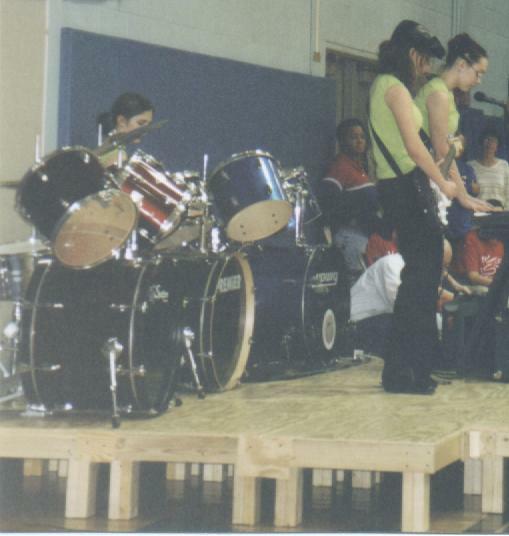 For literally months of Sandy and I rehearsing several times a week, Emi still hadn't a drum set. I picked up guitar and began playing rhythm guitar and bass riffs on a few songs, Emi had no drums. We began writing a movie about CST, Emi still had no drums. 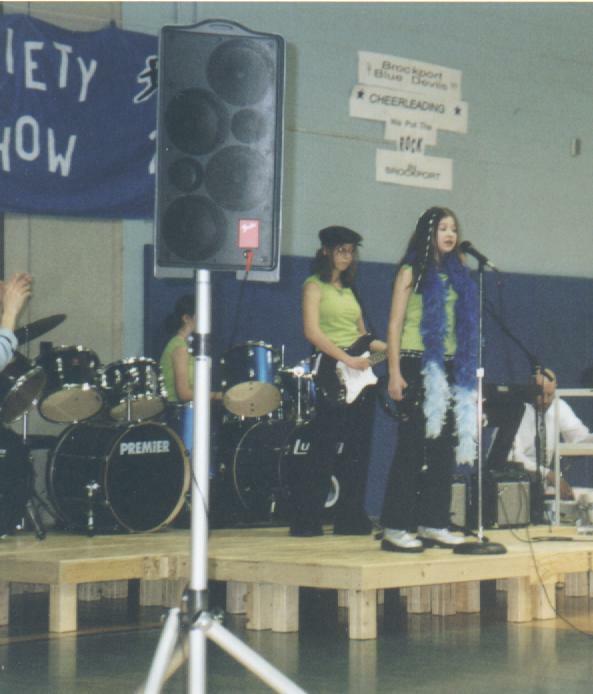 Shannon joined as our lead singer, Emi had no drums. 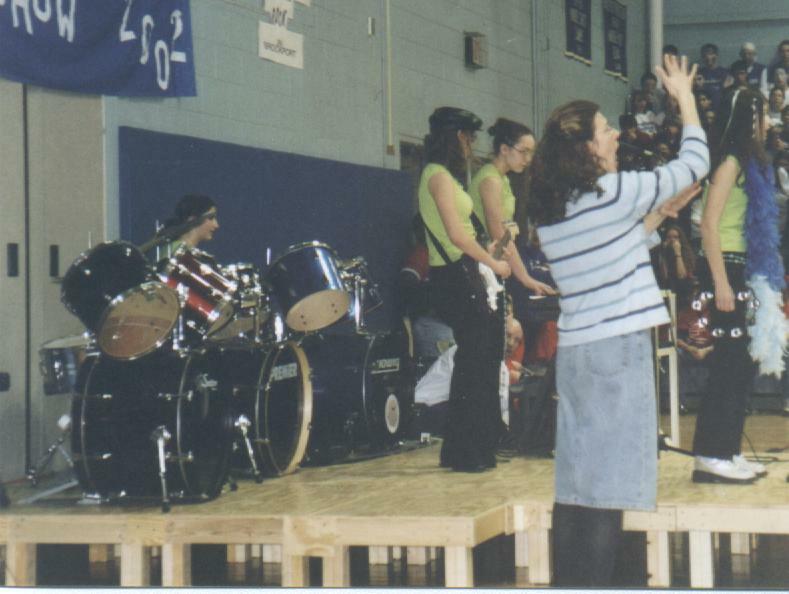 We began rehearsing at my church where there were drums, and we discovered that Emi didn't drum so well. 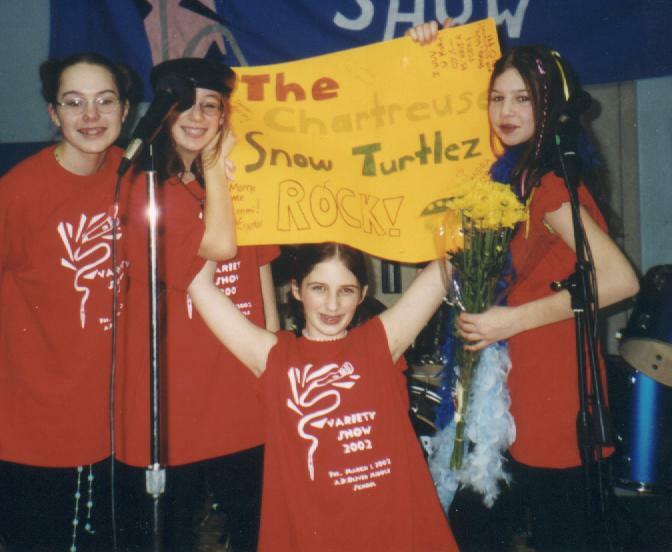 We entered our school's variety show try-outs, warning Emi that she better get a set before the audition. She finally got a drum set! CST auditioned "Lucy in the Sky with Diamonds" for the March 1st variety show. Three other bands auditioned too, we were so nervous. But...we got in! We were the only band who got in! It was our first performance, and we played for over 1,300 people! Towards the end of the month, we found out that Emi didn't have her drum set anymore, and that she didn't want to play drums anymore. She said she wanted to play bass. "Sure," I said. "If you can get a bass and learn how to play it." That same day we got a new drummer. Her name was Nicole, Cola for short. She was a very talented drummer who could pick up songs in a few minutes. We had two rehearsals with her, then she quit. She said that she was too busy to commit to CST. That broke me. CST was finally complete, and then Cola quit. A few weeks later, Elise volunteered to learn drums. We invited her to a rehearsal and she was pretty good, at least better than Emi. 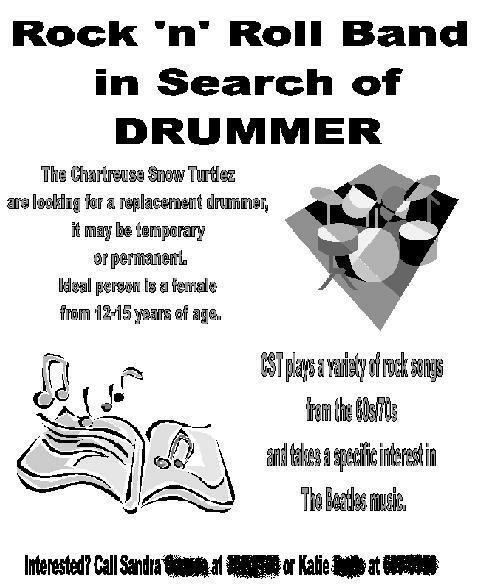 But...her mom said that there was no way she would get drums. So sadly, Elise was out. Over Memorial Day weekend, Sandy and I walked up to Main Street in our town with our acoustic guitars. We sat on a bench and played for about an hour. Suddenly a car pulled up in front of us. A women got out, and she appeared to be the owner of the antique store we were playing in front of. She listened to us for a while, then went into the store. When she came back out, she gave us two dollars and her business card. After she left, I looked at the card and said, "Sandra, that was the mayor." A little while later, we went down to an ice cream store and bought ice cream. We sat down at a little table, guitar cases next to us. A man who appeared to be the store owner asked us what kind of music we played. "60's/70's stuff mostly. Beatles, Led Zeppelin..." we replied. "Well then maybe you'd like to sit outside our store during festivals and stuff and play your guitars," he suggested. Of course we would! Now we are learning a new acoustic play list for when we are "guitar bums" on Main Street. Marital Status: married to George Harrison, Bob Dylan, Mick Jagger, Jim Morrison, Jimmy Page, Tommy Chong, Syd Barrett, David Bowie, Roger Daltrey, and Billy Boyd. In reality, dating a guy named Tyler. Favourite Beatle: GEORGE! Do we have to ask? Why did you join CST? : I founded it (with Katie) `cuz I was learning to play guitar and (still) itchin' to become a rock star! Favourite Song: "Happiness is a Warm Gun"
Why did you join CST? : Sandy came up with the idea of a band and I was like "Cool! That'd be great!" Favourite Song: "Here Comes the Sun"
Why did you join CST? : Because...I don't know! "The first thing that popped into my head when Katie and Sandy asked me to be the drummer was that they must be desperate!"